Welsh rock star Nicky Wire has taken centre stage in Pembrokeshire for what he confessed was his most nerve-wracking public performance. 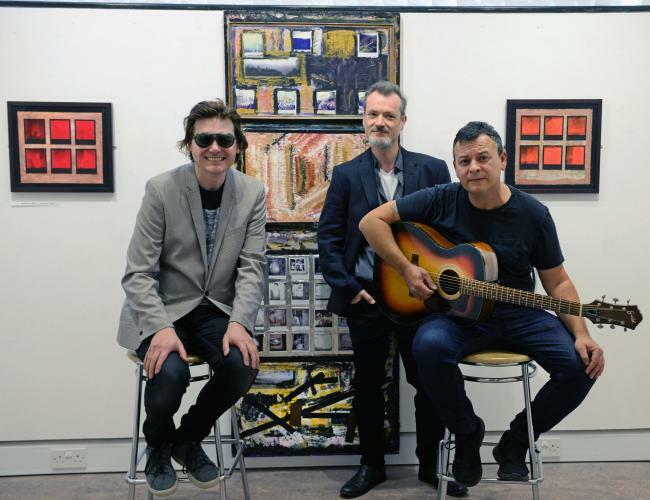 Fresh from finishing the Manic Street Preachers' latest world tour and playing Hyde Park with the band to an audience of 50,000, he was in Tenby on Friday for the opening of his first-ever solo art exhibition. Nicky, the band's bassist and lyricist, has a home in Tenby and is a regular visitor to the town's museum and art gallery, where he agreed to a suggestion from curator Mark Lewis to do the show. Manics lead guitarist James Dean Bradfield played a solo acoustic set to officially open Paintings and Polaroids, featuring over 30 works by Nicky. Said Nicky: "These artworks are mini tributes to people and places that have given me comfort and inspiration over the years. "I grew up obsessed by Polaroids - the beauty and simplicity, the accidental moment caught, the initial vivid colour and the eventual sad fade. "I'm so pleased to be having my first exhibition in Tenby. I've been lucky enough to have a flat here for the last 12 years, and it is a very special place with such a rich artistic history. "The works themselves are truly mixed media - foil, superglue, masking and Sellotape, nail varnish, glitter, make-up and, of course, paint. "The exhibition is a celebration of inspiration - Warhol's repeated images, the quilt paintings of John Uzzell Edwards, Yayol Kusama, Richter, Tracey Emin, Bert Stern, Dylan Thomas, Miles Davies.....the list is endless. "It's more nerve-wracking than any gig I've done as a musician. I hope people enjoy it." Prices of Nicky's works range from £125-£995, with the majority snapped up by buyers by the end of the weekend. Paintings and Polaroids can be seen daily at the museum between 10am and 5pm until Sunday October 21. This page was last modified on 18 September 2018, at 18:20.